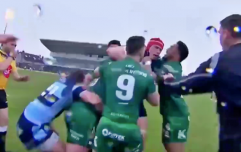 If you want a player to sum up Connacht's fighting spirit, look no further than Kieran Marmion. 24-10 to the good with 20 minutes to go, Connacht looked well placed to secure themselves Champions Cup rugby for next season. The Westerners had three tries, through Caolin Blade, Gavin Thornbury and Jack Carty, but were weathering a Cardiff comeback. The Welsh outfit were desperately trying to get the scoreboard moving again and they look destined to score when play swept out to the left wing. Jason Harries took a pass in full flight and looked certain to score in the corner. He did not reckon on Kieran Marmion, however. The Connacht scrumhalf has previous when it comes to all-out tackles for the cause. In 2016, he drove Aussie flanker David Pocock out over the sideline and, six months later, walloped Wales' No.8 Ross Moriarty. Harries must have fancied his chances, all the same. The Cardiff winger pinned his ears back and zoomed for the corner. Marmion flung in all his chips and stuck a hefty shoulder into Harries' ribs. It was just enough to put the winger off and although he grounded the ball, Marmion's tackle had shunted him towards the sideline and his left hand touched the sideline at the same time as he grounded the ball... NO TRY! TMO replays planted enough seeds of doubt and a word of praise to Tiernan O'Halloran, who scrambled over to make it difficult for Harries too. What of Marmion? He looked to have been concussed in making the tackle and he came off after some treatment from medics near his own tryline. Caolin Blade came back on the pitch for his fellow scrum-half, to see out the game. In all, Marmion had been on the pitch for less than three minutes but what an impact he made. With 10 minutes to go, Cardiff's maul did bosh over for a try in the corner and Gareth Anscombe made a touchline conversion. From the restart, Connacht sealed the win when Matt Healy scored in the corner after Cardiff spilled the ball in their own 22.